“(1) Harmful magnetic conditions, as the result of man’s wrong handling of force, are the causes of evil in the world around us, including the three sub-human kingdoms. How can we, as individuals, change this? By the development in ourselves of Harmlessness. Therefore, study yourself from this angle. Study your daily conduct and words and thoughts so as to make them utterly harmless. Set yourself to think those thoughts about yourself and others which will be constructive and positive, and hence harmless in their effects. Study your emotional effect on others, so that by no mood, no depression, and no emotional reaction can you harm a fellow-man. 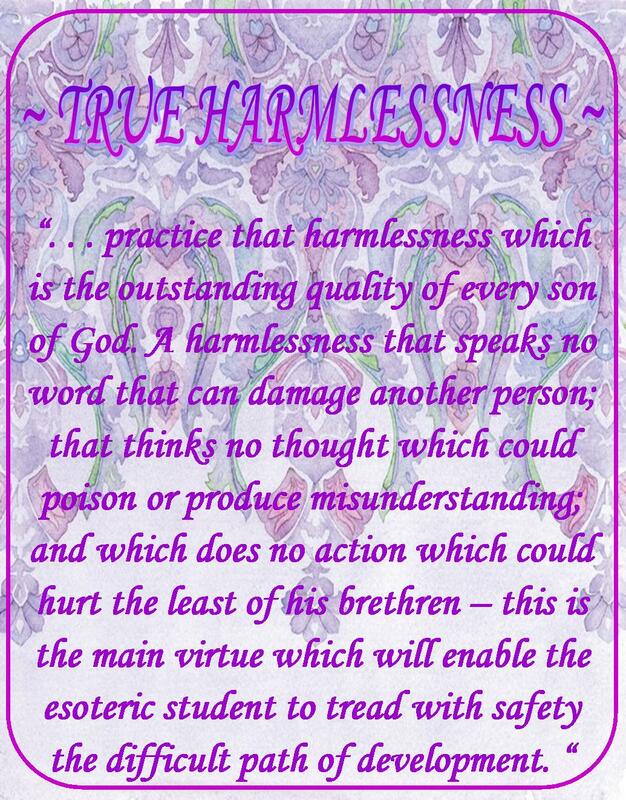 Remember in this connection, violent spiritual aspiration and enthusiasm, misplaced or misdirected, may quite easily harm a fellow-man, so look not only at your wrong tendencies but at the use of your virtues. Therefore, I say to you at this time, I – an older and perhaps more experienced disciple and worker in the great vineyard of the Lord – practice harmlessness with zest and understanding, for it is (if truly carried out) the destroyer of all limitation. Harmfulness is based on selfishness, and on an ego-centric attitude. It is the demonstration of forces concentrated for self-enforcement, self-aggrandisement, and self-gratification. Harmlessness is the expression of the life of the man who realises himself to be everywhere, who lives consciously as a soul, whose nature is love, whose method is inclusiveness, and to whom all forms are alike, in that they veil and hide the light, and are but externalisations of the One Infinite Being. This realisation, let me remind you, will demonstrate in a true comprehension of a brother’s need, divorced from sentiment and expediency. It will lead to that silence of the tongue that grows out of non-reference to the separate self. It will produce that instantaneous response to true need which characterises the Great Ones who (passing beneath the outer appearance) see the inner cause which produces the conditions noted in the outer life, and so, from that point of wisdom, true help and guidance can be given. Harmlessness brings about in life caution in judgment, reticence in speech, ability to refrain from impulsive action, and the demonstration of a non-critical spirit. So, free passage can be given to the forces of true love, and to those spiritual energies which seem to vitalise the personality, leading consequently to right action. Let harmlessness, therefore, be the keynote of your life. (2) I tell you that the achieving of harmlessness in the positive sense (not in the negative) means the attainment of that step which leads definitely to the Portal of Initiation. When first mentioned, it sounds of small moment, and to bring the whole subject of initiation into such small account that it becomes unimportant. But let him who so thinks practice that positive harmlessness which works out in right thought (because based on intelligent love), right speech (because governed by self-control), and right action (because founded on an understanding of the Law), and he will find that the attempt will call forth all the resources of his being and take much time to achieve. It is not the harmlessness that comes from weakness and sentimental loving disposition, which dislikes trouble because it upsets the settled harmony of life and leads to consequent discomfort. It is not the harmlessness of the little evolved negative impotent man or woman, who has not the power to hurt because possessing so little equipment wherewith damage can be done. It is the harmlessness that springs from true understanding and control of the personality by the soul, that leads inevitably to spiritual expression in every-day life. It emanates from a capacity to enter into the consciousness and to penetrate into the realisation of one’s brother, and when this has been accomplished – all is forgiven and all is lost sight of in the desire to aid and help. (3) Let the “Forces of Light” flow through, and the ranks of the world servers will be rapidly filled. Let the “Spirit of Peace” use the lower nature as instrument, and there will be peace and harmony within the personal field of service. Let the “Spirit of Goodwill” dominate our minds, and there will be no room for the spirit of criticism and the spreading of destructive discussion. It is for this reason and in order to develop a group of servers who can work along true and spiritual lines, that there must be increasing emphasis upon the need for Harmlessness. Harmlessness prepares the way for the inflow of life; harmlessness dissipates the obstructions to the free outpouring of love; harmlessness is the key to the release of the lower nature from the grip of the world illusion, and from the power of phenomenal existence. (4) I have so emphatically impressed the need of harmlessness upon all of you, for it is the scientific method, par excellence, and esoterically speaking, of cleaning house, and of purifying the centres. 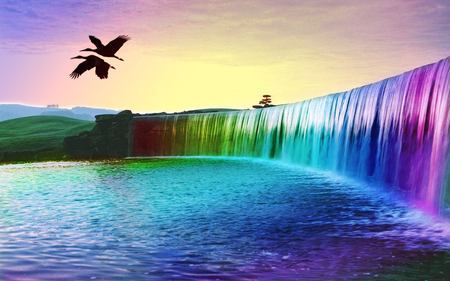 Its practice clears the clogged channels and permits the entrance of the higher energies.